Nicci is a former goalkeeper for the Canadian Women’s National Team with 37 caps, 37 starts and 11 shutouts. She represented Canada at the 1999 FIFA Women’s World Cup. 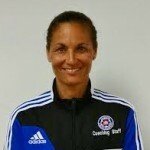 Nicci won Gold at the 1998 Women’s CONCACAF Championship. She was a goalkeeper with the 2000 World Indoor All-Star Team. Nicci played professionally overseas in the Swedish Damallsvenska, and was voted the 2002 Footballer of the Year for Northern Sweden. She played professionally for the Washington Freedom, winning the 2003 WUSA Founder’s Cup Championship. Nicci was inducted into the Hall of Fame at the University of Victoria in 2013. Nicci is currently the Arlington Age Group Director for 15U-19U Girls, Director of Goalkeeping, and Head Coach of the 1999 Girl’s Red and 2000 Girl’s Red teams. She was awarded the United Soccer Coaches 2017 Youth Girl’s East Region Coach of the Year and the Arlington Soccer 2016 Travel Coach of the Year. She won the 2017 Girl’s VYSA State Cup with Arlington 1999 Girl’s Red team.